Following our success at the Cornwall Tourism Awards in December for our Padstow guest rooms, we are delighted to let you know they have received a silver award in the South West Tourism Awards 2015-16. 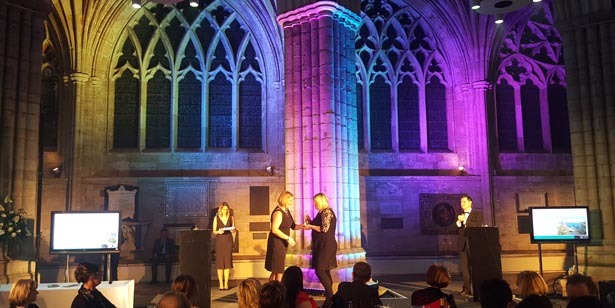 The awards, held at Exeter Cathedral, celebrate the very best of the South West hospitality industry, recognising the South West’s leading tourism businesses. 95 different awards were announced following a rigorous 3-stage judging process of marking, visits and panel meetings, in which a record 490 entries were considered. Winners were spread across the whole region from the Isles of Scilly and Cornwall in the west to Bournemouth, Dorset and Salisbury in the east, and from Salcombe in the south to Bristol, Bath and Gloucester in the north. Padstow Seafood School was also highly commended in the Cultural, artistic and learning experience category, completing a hat-trick of recent accolades for the cookery school at the Food reader magazine awards and the Cornwall Tourism Awards. We have over 40 guest rooms in Padstow as well as Bryn cottage and self-catering properties in nearby Trevone and Martindale, take a look at all of our guest rooms here.